Movie Trailer for Cirque Du Soleil: Worlds Away 3D. Igor Zaripov and Erica Kathleen Linz star in the 3D fantasy adventure. 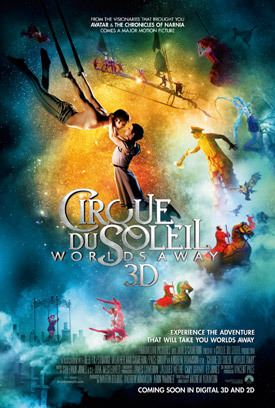 You can watch the movie trailer for Cirque Du Soleil: Worlds Away 3D below. A young couple who is separated must journey through the astonishing and dreamlike worlds of Cirque du Soleil to find each other, as audiences experience the immersive 3D technology that will allow them to leap, soar, swim, and dance with the performers. MPAA Rating: (PG) for some dramatic images and mild sensuality. From the big top to the big screen, visionary filmmaker James Cameron and director Andrew Adamson (Shrek, Narnia) invite you and your family on an all new 3D adventure: Cirque du Soleil Worlds Away. A young couple who is separated must journey through the astonishing and dreamlike worlds of Cirque du Soleil to find each other, as audiences experience the immersive 3D technology that will allow them to leap, soar, swim, and dance with the performers. This holiday season, Cirque du Soleil brings their world to your city!